At Enterpack we call the tooling the heater set, this comprises of a top cassette and a bottom plate. The heater set is essential as without it the machine cannot seal trays. The heater set guides the tray into the machine, seals it and then profile cuts the film around the edge of the tray. Every machine is provided with one heater set. Additional heater sets can be purchased to seal a wider range of trays. Heater sets are easy to change and with a little practise can be changed in less than 30 seconds, no screw drivers or allen keys are required. How do our machines work? 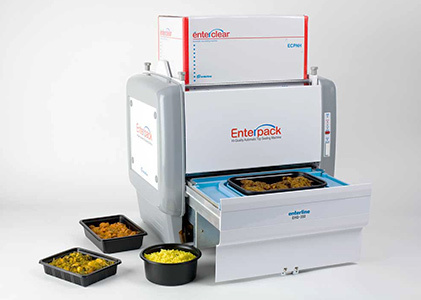 Enterpack machines make sealing food trays quick and easy.